OU Degree, PG Results: OU LLB, MPhil Results 2018 (Osmania University): Osmania University has declared the results of LLB examinations. The results of LLB Honours, LLB, B.Com LLB and BBA LLB results have been announced. The varsity has also declared the results of M.Phil (Clinical Psychology) and M.Phil (Rehabilitation Psychology). The candidates can check the results through the official website, osmania.ac.in. 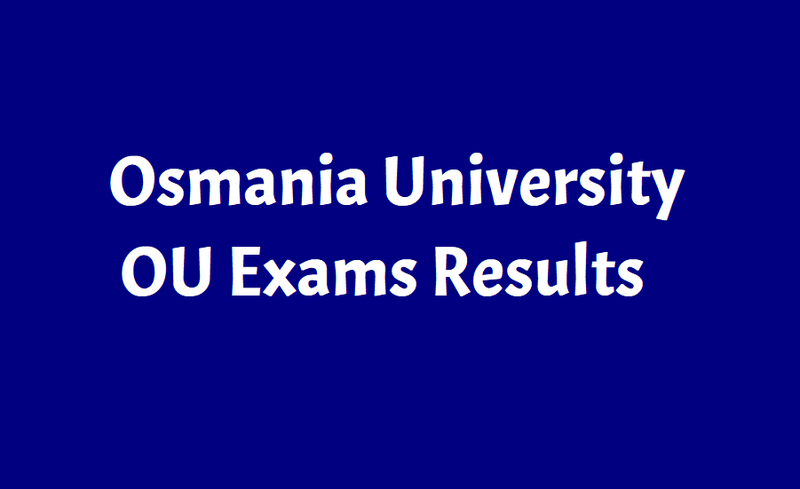 Osmania University Results 2019 released for UG & PG courses at osmania.ac.in. Osmania University has released exam results for various courses on the official site of the university. The results released for various courses Undergraduate and Post Graduate courses offered by the University. The examination for all of the courses was conducted in November- December 2018. Candidates can check their results from the official site of Osmania University at osmania.ac.in. The UG & PG courses results include Post Graduate Diploma in Computer Applications (PGDCA) conducted in December 2018, Bachelor of Hotel Management and Catering Technology (BHMCT) conducted in November-December 2018 and Bachelor of Catering Technology and Culinary Arts (BCTCA) conducted in November-December 2018 on the official site of the University. Candidates who have appeared in any of these examinations can check their results through the official site of Osmania University by entering their hall ticket number. The steps below will help the appeared candidates to check their results will ease. Step 1: Visit the official site of Osmania University at osmania.ac.in. Step 2: Click on ‘Examination Results’ link available on the home page. Step 3: A new page will open where candidates will have to click on their respective course. Step 4: Enter the hall ticket number on the new page opened. Step 7: Download the result and keep it for further reference. Go to the official website osmania.ac.in. On the home page go to Results section. Alternatively, click on OU Degree Result link here. On the new page, click on the respective link of the course you wish to check the result of. The BA Languages Revaluation Result 2018 is now available on the link provided here. OU Degree, PG Results: Osmania University CDE Degree, PG Results 2018: Osmania University has declared the results for Undergraduate, UG Regular and Vocational Supply Examinations 2018. The OU Results 2018 for BA, BBA, BCom September Supply Exam 2018 are now available on Osmania.ac.in. The steps and direct link to check the results are provided below. Students who have appeared in the regular, vocational or CDE examination of the three courses can now check their results. Please note that the official website Osmania.ac.in is not reachable due to heavy traffic. Students may also check their results on schools9.com website. The alternative website link is also provided below for quick reference. About Osmania University: Osmania University was established in 1918. It is the 7th oldest University in India. The University is located in Hyderabad. It offers 250 UG Programmes with 158 combinations, 75 PG Courses, 27 PG Diploma Programmes and 2 Research Programmes at M.Phil and PhD Levels. Every year, OU conducts the degree Under Graduate examinations for all the 1st, 2nd and 3rd year students in March and April. Step 3: Click on the first link that says: "Examination Results"
Osmania University results 2018 of BPharm, MBA: Osmania University announces BPharm, MBA 2018 results. Osmania University OU B.Pharm, MBA results announced, check at osmania.ac.in. The Osmania University has released the results for B.Pharmacy (CBCS-PCI) July/August 2018, B.Pharmacy (NON-CBCS) 4/2 Make-Up September 2018 and MBA (MAM) July/August 2018 on its official website http://www.osmania.ac.in/. Candidates, who have appeared for the exams, can check at the official Osmania University website, osmania.ac.in by entering their 12-digit hall ticket number. The Osmania University (OU) has declared the results of B.Pharm, MBA examinations. All those candidates who have appeared for the exams can check their results from the official website osmania.ac.in. The examinations was conducted in the months of July to August.